Heat a casserole over medium-high heat. Once hot, toast the guajillo chiles, turning often, until toasted deeply browned and you can smell the chile fumes, about 2 minutes. Add the tomatillos and garlic, cover with water, and bring to a boil over high heat. Reduce heat to medium and simmer until the tomatillos are thoroughly cooked, their color has changed from a bright green to olive, and the guajillos have plumped up and rehydrated, about 12 minutes. Remove from the heat. Using a slotted spoon, transfer the tomatillos, garlic, chiles and 1/2 cup cooking liquid to a blender. Allow to cool slightly, add 1 teaspoon salt and puree until completely smooth. Drain the water from the casserole or soup pot, rinse and dry, and return to the stove. Add the oil and heat over medium heat. Once hot, add 1 cup of the chopped onion and cook until tender and the edges have just begun to brown, about 5 minutes. Add the tomatillo puree, cover partially as the thick sauce will splash and splutter, and simmer for about 7 to 8 minutes, until the sauce has thickened and darkened. Meanwhile combine the ground turkey with the breadcrumbs, egg, remaining 1/4 cup onion, remaining 1/2 teaspoon salt, and pepper. Mix together well. 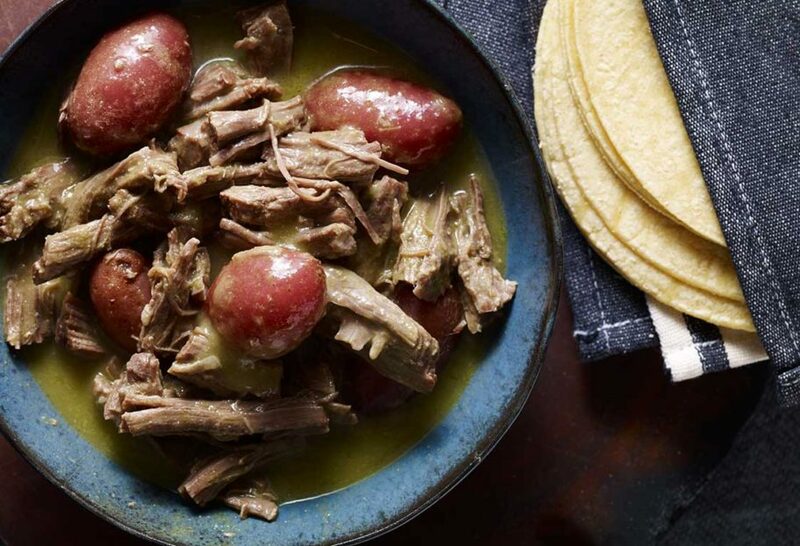 When the tomatillo puree has cooked down stir in the broth, scraping the bottom and sides of the casserole to incorporate any sauce sticking to the bottom and sides of the pan. Place the ground turkey mixture and a small bowl of water next to the casserole. Wet your hands, and start shaping the turkey into approximately 1 1/2-inch balls. 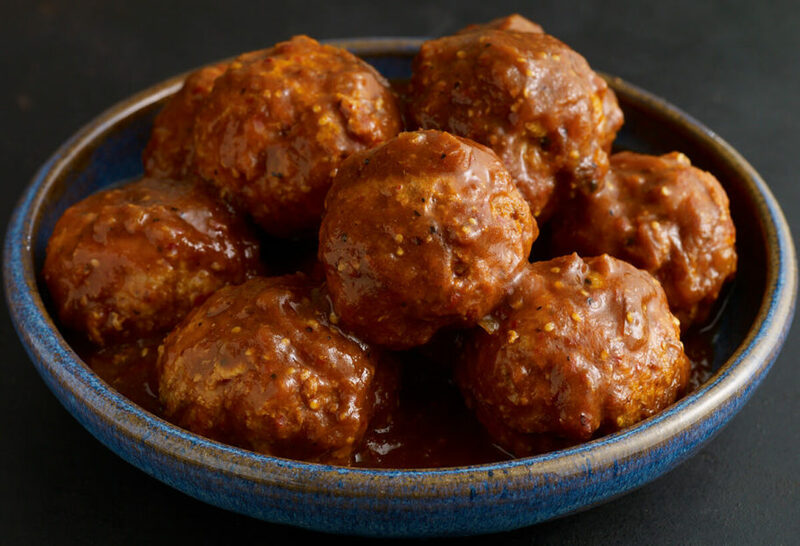 Gently drop the balls into the sauce as you form them. When all the meatballs have been added to the sauce, add the sprigs of epazote or cilantro and simmer over medium heat, uncovered, for 35 minutes. Serve. Add the rice and cook, stirring often, until it becomes milky white,crackles and feels heavier as you stir it in the pan, about 3 minutes. stirring and mixing with the rice, until the onion begins to soften. Add the chicken broth and salt and stir once. 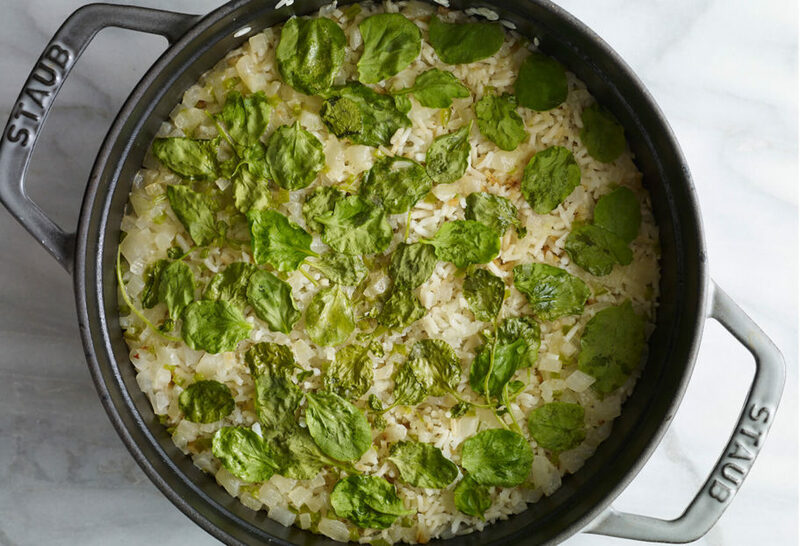 Raise the heat to high, bring to a rolling boil, add the chepil leaves, stir, cover and reduce the heat to the lowest setting. Simmer 12 to 15 minutes, until most of the liquid has been absorbed but there is still some moisture in the pan. add 2 tablespoons of water, cover again, and cook for a couple more minutes. Smoked chile, or Chipotle as it's called, is much more expensive to use, but easily had with just a bit (1/4 teaspoon), of smoked paprika added to this recipe! Heat water in saucepan over low to medium heat. Add frozen red chile allowing the chile to defrost and cook. Meanwhile, heat oil in a saucepan over medium heat. Stir in garlic while to lightly soften. Add oregano, salt (and sugar). Stir and bring to a boil. Reduce heat and cover. Simmer 10-15 minutes. I need to ask what form the contents of this container are. Is this a paste, chopped or whole. Melt the butter, stirring in the flour until smooth. Stir regularly to create a roux. Your roux is ready once it begins to tan and smells nutty. 1 cup of green chile (or peppers of some sort) to taste *sub salsa verde? Stir until smooth over medium heat for about 1/2 hour and serve. 2. Sauté the garlic and onions in a teaspoon of olive oil until soft, about 10 minutes. Set aside. 3. Heat the grapeseed or sunflower oil in the same skillet until smoking. 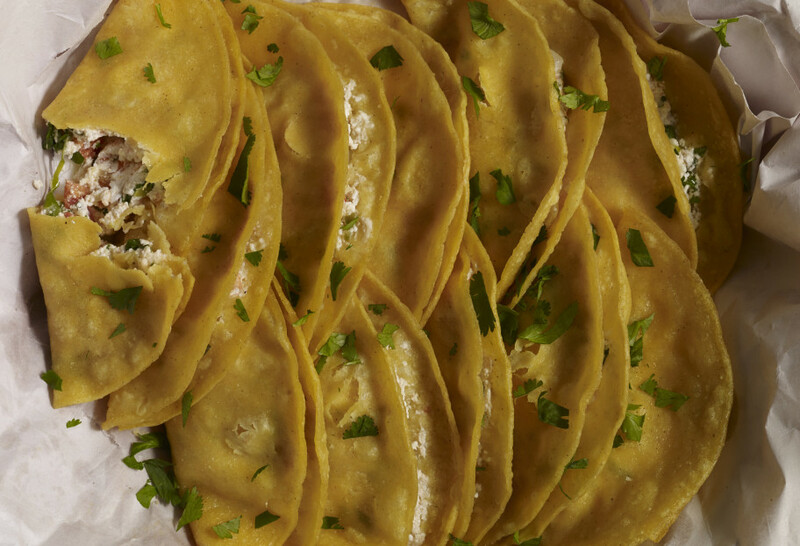 Briefly fry each corn tortilla for 3-4 seconds per side, to make them more pliable. 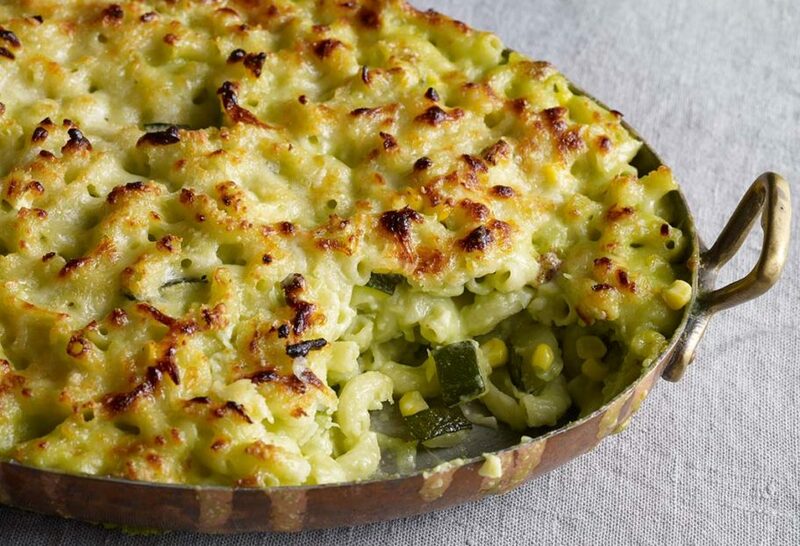 Put a layer of the corn tortillas in a baking pan. 4. Mix the shredded chicken, the chopped green chile (available online at the Hatch Chile Store), the cream of chicken soup, the chicken broth, and the chopped green onions together in a bowl. Then spread a layer across the corn tortillas in the pan. Top with a layer of shredded cheese. 5. Repeat the layers two or three more times. Top with the remaining cheese. 6. Bake for 30-35 minutes or until the cheese is melted and golden and the smell of the chile is wafting through your kitchen. 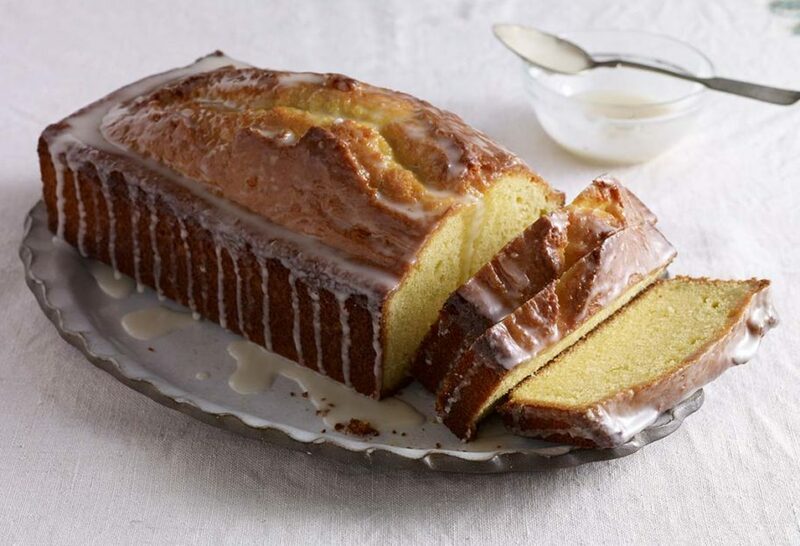 Allow to cool for about 10 minutes, and serve. 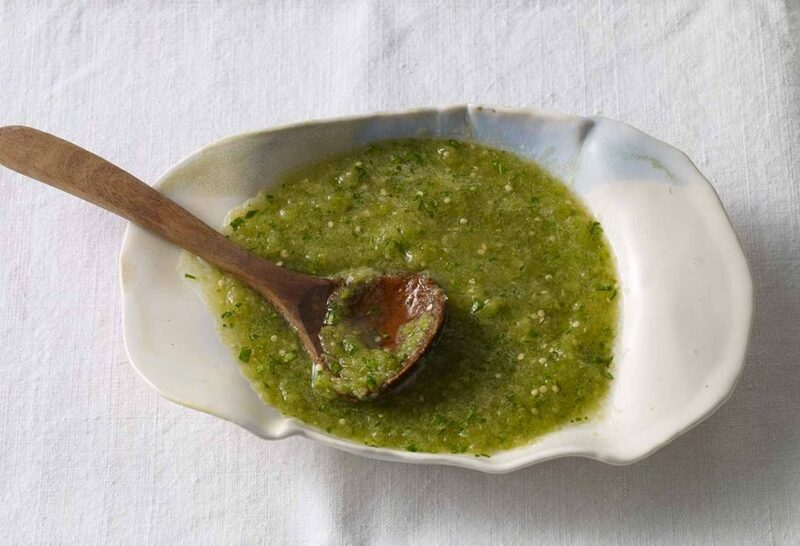 A quick green salsa recipe that she makes five times a week in her own home. You can use it to spice up any tacos, enchiladas, quesadillas, tostadas, and so on. 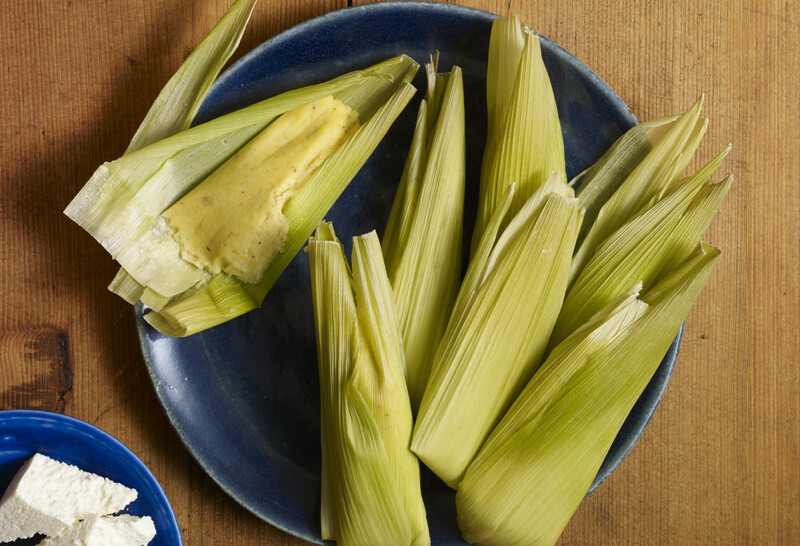 Serve with a side of warm corn tortillas. Heat a large skillet or comal over medium heat. Add the dried guajillo and ancho chiles and toast them for no more than 20 seconds per side, taking care not to burn them. Transfer the toasted chiles to a medium saucepan and add the water, place over medium heat and cook for 12 to 15 minutes, until the chiles have softened and rehydrated. Place the beef in a large bowl and cover it with the marinade. If you will not cook it that day, cover and place in the refrigerator for up to 48 hours. 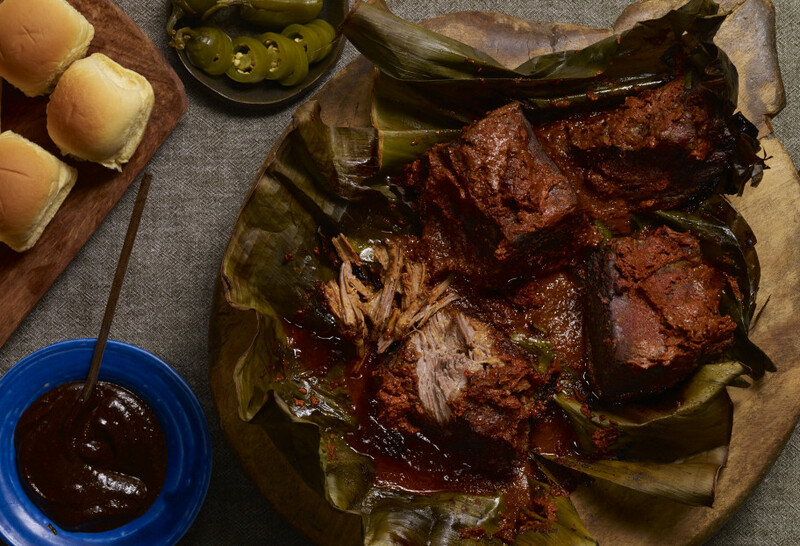 Wrap the individual meat chunks in pieces of banana leaf or aluminum foil as you would wrap burritos or tamales – making sure to add a generous amount of marinade in each packet. 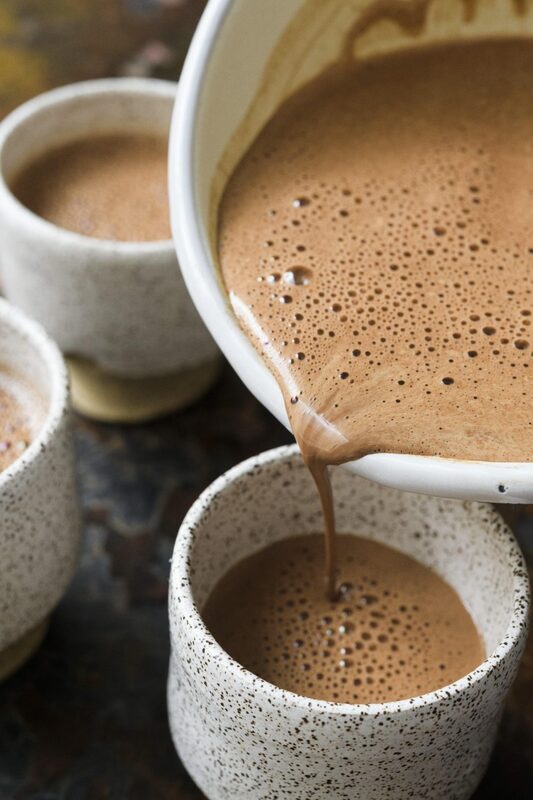 In a mixing bowl, combine the flour, salt and vegetable shortening with your hands, slowly incorporate the lukewarm water and mix until it can come together into a ball. Transfer to the counter and knead for about 2 to 4 minutes, until it is smooth like play dough. Divide the dough into halves until you have 16 balls of dough. Place them on a floured sheet or board, cover with a clean kitchen towel and let them rest for 25 to 35 minutes. 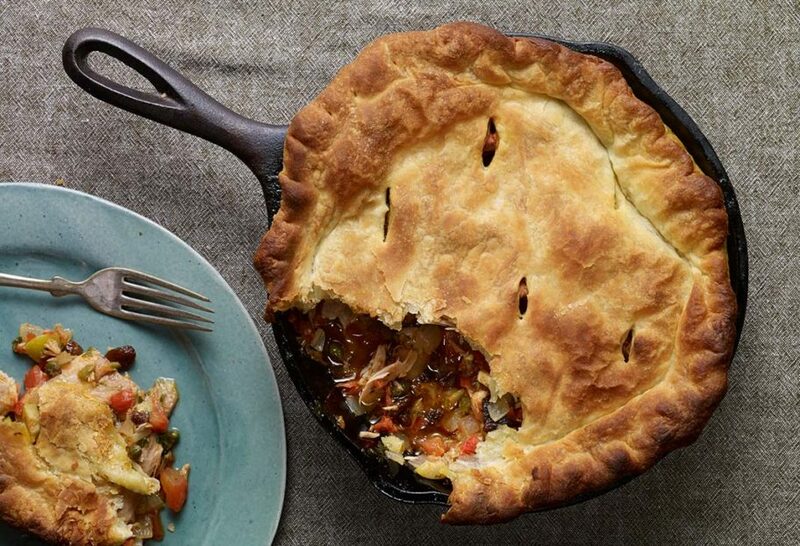 Heat your comal or ungreased cast iron or non-stick skillet over low heat. On a lightly floured surface, roll out each ball with a floured rolling pin, rotating 5 or 6 times until you get a 7” round. Place the tortilla on the already heated comal or skillet. You will hear a faint sizzle. 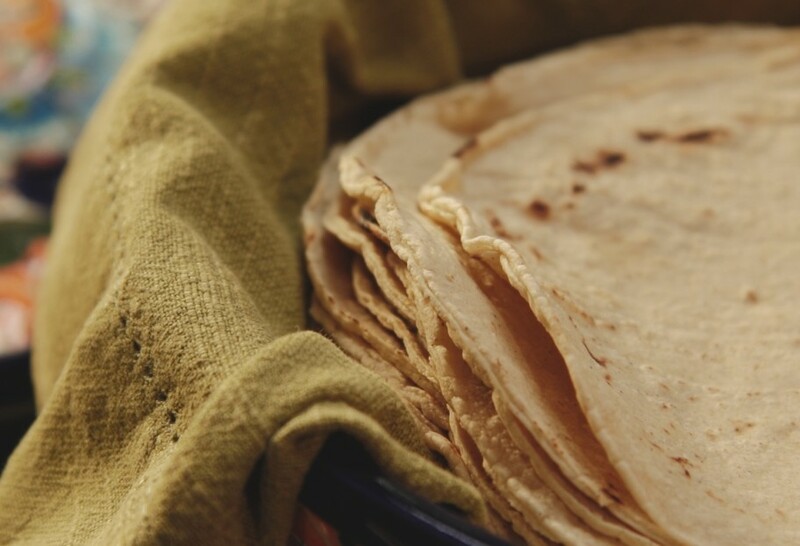 After 40 to 50 seconds, when there are brown freckles on the bottom side and there are air bubbles puffed up all over the tortilla, flip over. Cook for 40 to 50 seconds more, until the other side is freckled and the tortilla puffs up even more, like pita bread. Green chiles are mild, so add some red pepper flakes if you’d like extra heat. Preheat oven to 375F. Cook hamburger meat and onion. Drain, then add cumin, salt, and pepper. Spray your pan lightly with non-stick cooking spray, then line the bottom of your pan with whole green chiles (chop extra green chiles for later). Layer meat over green chiles. Top with cheese and chopped green chiles. Whisk together eggs and milk, then add flour and mix well. Pour this mixture over dish. Bake for 35 to 40 minutes. Serve right away while everything is hot and cheese is melted. Preheat oven to 375F. Cook hamburger meat and onion. Drain, then add cumin, salt, and pepper. Line the bottom of your pan with whole green chiles (chop extra green chiles for later). Serve right away while everything is hot and cheese is melted. Yum! 1. In a pot set over medium heat, heat the olive oil. Add ground beef and sauté, breaking up with a spoon, until browned and cooked through. 2. Stir in the beans, tomatoes, corn, Hidden Valley® Original Ranch® Salad Dressing and Seasoning Mix and broth. Break the tomatoes up with a spoon. 3. Continue to cook for another 10-15 minutes, until the flavors are blended. Serve hot with toppings of choice.